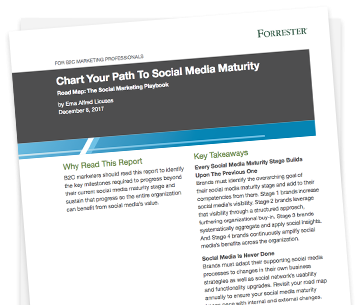 Read this report to identify the key milestones required to progress beyond your current social media maturity stage and sustain that progress so the entire organization can benefit from social media’s value. How mature is your social media marketing? Forrester Research reports that there are four stages of maturity that brands move through as they optimize social media for customer experience and business impact. Each stage builds upon the previous one. What stage is your brand at and how can you prepare to move to the next level? Knowing your maturity level will help you understand and optimize the impact of your social media initiatives.